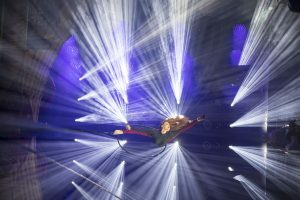 Robe enjoyed an incredibly busy and successful Prolight+Sound 2018 expo, which saw their exhibition live show concept taken to new levels with ‘Cirque Robe’, a colourful, hi-energy 6-minute performance spectacle and circus style presentation with a cast of 11, designed to highlight the Czech manufacturer’s latest lighting technologies. Another highlight was Robe’s new MegaPointe multipurpose moving light winning a 2018 PIPA (Prolight + Sound International Press Award) for ‘Best Light’, a decision reached by a jury of international trade journalists who meet annually in Frankfurt. The MegaPointe was one of the primary fixtures featured in the stand show, where Robe continued to raise the bar in presenting unique live exhibition entertainment, with an ever-rising element of expectation accompanying each one. CEO Josef Valchar commented, “Our goal was to showcase the products in an entertaining, fun and highly visual environment, and in ‘Cirque Robe’ we have realised a very ambitious show that has created a real buzz! This has helped attract people to the stand constantly throughout the four days of the expo, and we are delighted with the results and feedback!” The show was staged every hour on the hour and pulled record crowds to the Robe stand in Hall 3.0 of Frankfurt’s Music Messe, where they could also engage with Robe’s multi-lingual team and receive individual product demos in two dark studio areas … as well as enjoy the traditional Czech hospitality and some prime networking opportunities. The Cirque Robe concept was originated by Robe’s own creative team led by Nathan Wan and Andy Webb. Nathan first thought of the Cirque idea after Prolight 2017 which put a live show central to the booth for the first time and was extremely well received. 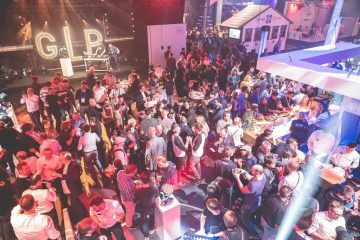 This was followed by the ‘Mirror Man’ show for PLASA and LDI 2017, upping the ante as Robe led a trend for producing high-impact exhibition lightshows with real performers. Rather than having a stage this year, Nathan wanted to draw the entire booth into the viewing experience and make it more immersive, which spawned the 8 metre spherical ring stage design, four trussing ‘king poles’ and 270 degree seating. When Josef signed off the visuals in December, Nathan, Andy and production manager Josh Williams all started working intensively on ensuring Cirque Robe became a reality. Chris Manoe was commissioned to choreograph and creatively direct the performance and develop the narrative to Nathan and Andy’s brief, introducing his own steam punk twist to the costumes. Nathan worked on the lighting design and visuals, all the time keeping the focus on the product showcasing, a collaborative process which included shaping the performance to the best and most inventive ways of showing off the lights and their effects. 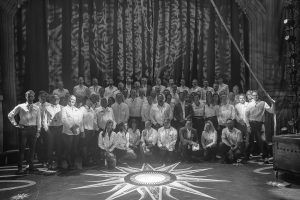 Meanwhile Andy worked in parallel but on different aspects of the show including the elaborate scenic elements of the whole stand and for the Cirque Robe show, developing the soundtrack and show direction with Chris. A fine balance was needed to ensure the lighting took centre stage … supported by the other elements, and not the other way around – and this took a lot of communication and thought. 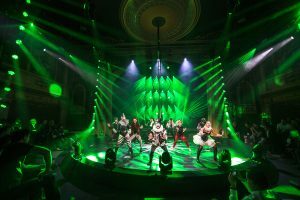 Two types of Robe luminaires were the primary fixtures of the show … the newly launched MegaPointe and the upcoming Tarrantula wash beam, a decision driven by the desire to produce a strong and well defined lightshow. Forty-two MegaPointes were distributed between four trusses in a grid on the stage at the back of the spherical cirque arena – revealed by a set of Austrian curtains – and also on two circular trusses above the arena. 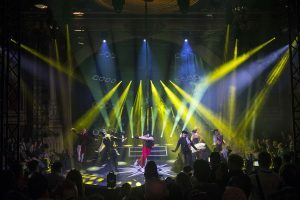 The thirty-six Tarrantulas – an LED wash powered by 36 x 30W and one 60W high powered LED chips, providing a jaw-dropping 20,000 lumens of output – also rigged on the on-stage / upstage trusses in groups of four, flanking the MegaPointes. They were arranged to illustrate how they can be utilised as a low resolution video surface, especially during the aerial section of the show, punching through the MegaPointes. As well as a powerful and very bright wash beam, fed with video sources via the on-board ArKaos Klink-Net protocol, the Tarrantulas can produce some amazing effects which increase their versatility. The MegaPointe, launched in September, has been one of Robe’s most successful lighting fixtures ever. It is an equally high quality spot, beam or wash light with a versatile array of effects … and fewer fixtures can go a long way as was demonstrated! MegaPointes have already been used on numerous interesting and imaginative designs on a diversity of shows and events by designers and lighting professionals working in all sectors. 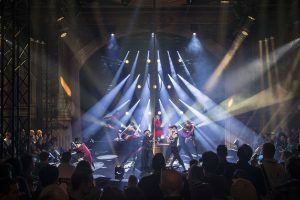 The four vertical ‘king pole’ trusses accentuating the shape of the performance space were each rigged with an elegant vertical line of 12 x Robe’s LEDBeam 150s, another new and very popular small moving light. Additional LEDBeam 150s were scattered around the rig making up a total of 64. Spikies were positioned along the lip of the stage behind the cirque arena with 16 around the perimeter of the arena itself, used for a variety of specials and to pull everyone’s attention to that part of the stand. ParFect 150 fixtures fitted with Robe Halo LED rings were deployed around the larger circular truss in the roof in four blocks of six. Also on these circles were 36 x Spiider wash beams used for general booth-wide environmental illumination and for eye-catching effects onstage with their central flower effect. A mix of DL4S and DL7S Profiles deployed on the circle trusses key lit the cast, and more DL4s picked out the ‘classic’ circus style posters and other feature elements around the booth, illustrating the precision of the DL series shutter systems. 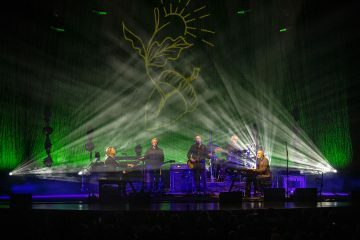 Atmospheric effects for the show were delivered courtesy of an MDG The One and an ICE FOG Compack. Robe’s new remote RoboSpot follow spotting system was an integral part of the show. One BMFL Spot with the on-board motion control camera was used to accurately pick up and follow the show’s MC. This worked in conjunction with one RoboSpot MotionCamera driving six BMFL Blade fixtures, all working together to highlight specific moments in the show. These – the one plus the six BMFLs respectively – were operated via two RoboSpot BaseStations positioned towards the back of the stand. This illustrated the flexibility and power of the RoboSpot system which is also being specified increasingly as a solution for scenarios where manually operated follow spots are not a practical option. In addition to the wall of onePATTs – the newest member of Robe’s growing PATT family of retro-style lighting fixtures – on the stage grid, Nathan created four bespoke onePATT chandeliers in a three-tier 8-4-1 format which were suspended in the booth roof and caught a lot of eyes! The chandeliers were part of the intricately detailed scenic design featuring throughout the booth interior and exterior, including a massive amount of bespoke printed draping all reinforcing the classic circus theming … with a Robe twist. Across the aisle, Robe’s premium architectural / ‘archi-tainment’ brand Anolis also had a completely new look booth bringing a slick, contemporary feel to their dedicated space which highlighted the latest products … connected but separate from the freneticism of the main Cirque Robe venue. A number of Anolis’s new RGBW and tuneable white Ambiane fixtures were integrated into a feature ceiling above the bar and reception area to provide working light for staff. The challenges of installing the booth were mainly the tight timeframe. Essentially the project entailed designing and building a purpose-built venue, compete with a full scale show, all integrated into a busy working exhibition stand. Two days of lighting previsualisation in the UK helped Nathan establish the basic building blocks of the show and booth lighting, which was followed by around 20 hours of intensive programming on site using an Avolites Arena console running in a multi-session network with a Tiger Touch II Pro, plus a Quartz for system tech’ing. This allowed Josh and Andy to work on fine tuning the booth’s scenic aspects while Nathan continued uninterrupted lighting programming the 52 universes of DMX. The video sources for the Tarrantulas were run from an ArKaos Stage Server Pro. 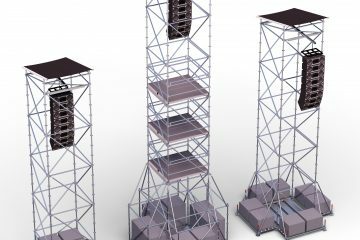 Rigging – 46 points in total – and lighting crew were supplied by Satis and Fy. Andy and Nathan revealed that much of the initial design work and discussions take place at 37,000 feet as they utilise their flying / in the air time constructively, bringing a new take on ‘creative highs’. ‘Robe Cirque’ live was a one off production phenomenon, leaving a hugely memorable stamp for the brand on Prolight+Sound 2018. The Robe team will continue staging furrther dramatic and spectacular presentations at upcoming major international trade shows throughout 2018 … so watch this space!